America's top soldier says the world is witnessing a return of an open competition between the U.S. and its allies and old adversaries Russia and China. Gen. Joseph Dunford says the U.S. is having to adapt its military strategy to confront new challenges presented by the re-emergence of these old foes. That's a change from the 1990s and early part of this century, when the Allies could "project power when and where necessary to advance our collective interests relatively uncontested," he told delegates at the Halifax International Security Forum on Saturday. "The military dimension of that great power competition is, in fact, the efforts that China and Russia in particular have taken to undermine the credibility of the U.S. and its allies to meet Alliance commitment, whether it be in Europe or in China," Dunford said. 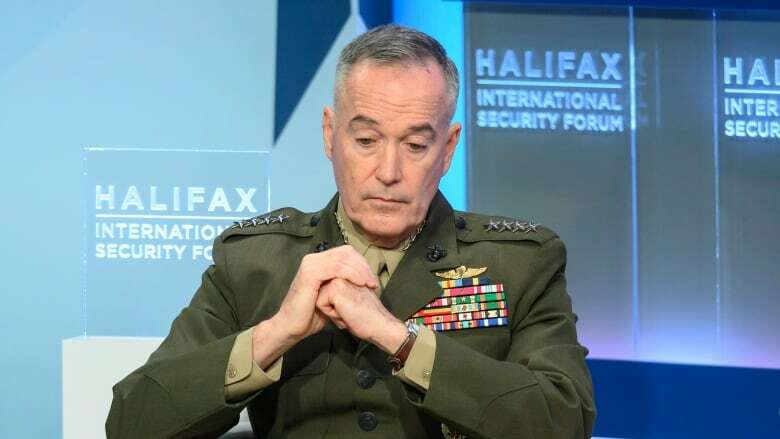 Dunford insists the U.S. and its allies continue to have a competitive advantage over any adversary, but he's not complacent about the need to modernize and to address new threats such as cyber-warfare and violent extremism. "We do have a technological advantage over Russia and China," he said. "But if you look at the investments they have made over the past decade, they have invested at a greater rate for tomorrow than we have." This week a report by civilian and military experts warned that the 2018 U.S. National Defence Strategy lacks the needed financial resources, and warned that, despite the new focus on Russia and China, the U.S. risked being overwhelmed by those countries if there was a conflict. As chair of the U.S. Joint Chiefs of Staff, Dunford oversees the work of every branch of the U.S. armed forces and is responsible for meeting the objectives of the defence strategy. "We don't say that, necessarily, competition equals conflict. But, again, in the military dimension, our responsibility is to assure our partners that we can deter potential adversaries. We can respond in the event deterrence fails," Dunford says. Canada is facing similar challenges in responding to the ever-changing nature of security threats. Gen. Jonathan Vance, chief of the defence staff, told CBC's The House this weekend that the Trudeau government's defence policy requires armed forces to take a more holistic approach to security issues. That includes working with the Americans to modernize NORAD to deter incursions by Russian submarines in Canada's Arctic, and to address the continued nuclear posturing of North Korea. "We have to think about new ways to deal with these threats. Not everything is a shoot-down type of scenario," he said. "We have to watch technology and those things that, at a strategic level, could cause potential harm to our countries." The policy also led Canada to contribute a warship to U.S. naval exercises in the South China Sea, to deter China from unilaterally laying claim to international waters. "Exercising freedom of navigation through the vital trade routes in the South China Sea is simply a continuation of the international norms that the world needs to be prosperous and safe," Vance said. Both military leaders also spoke in Halifax about the military's role in dealing with potential threats posed by mass human migration around the world, as people seek safer havens to escape poverty and violence. President Donald Trump ordered more than 5,000 U.S. troops to the border with Mexico to stop the so-called caravan of migrants heading north from Central America. Dunford told the forum that the role of soldiers is to support the work of police and border patrol officers with the Department of Homeland Security. "Nothing we are doing is illegal. I can tell you we looked at that very carefully," he said. "We are not coming in contact with the migrants. Our job is not to deny access to migrants to the United States. I think it's important people understand that." Vance told The House that mass migration is a problem, but the answer is not to thwart migrants, but to address the reasons they are on the move. "And these things tend to be tied together. We must understand that problems are not in and of themselves for the military to solve or to define. More and more the security threats we face, the defence threats that we face, can be seen through so many lenses that we have to tie it all together." Earlier this month, the Trudeau government unveiled a campaign to inform Canadians of the benefits of immigration. The campaign followed weeks of pressure from the opposition Conservatives who've called the influx of asylum-seekers from the U.S. a crisis. At the same time, Canada Border Services Agency is stepping up efforts to deport failed refugee complainants. More than 68,000 asylum-seekers have crossed the border into Canada since the beginning of last year. Chris Hall is the CBC's National Affairs Editor and host of The House on CBC Radio, based in the Parliamentary Bureau in Ottawa. 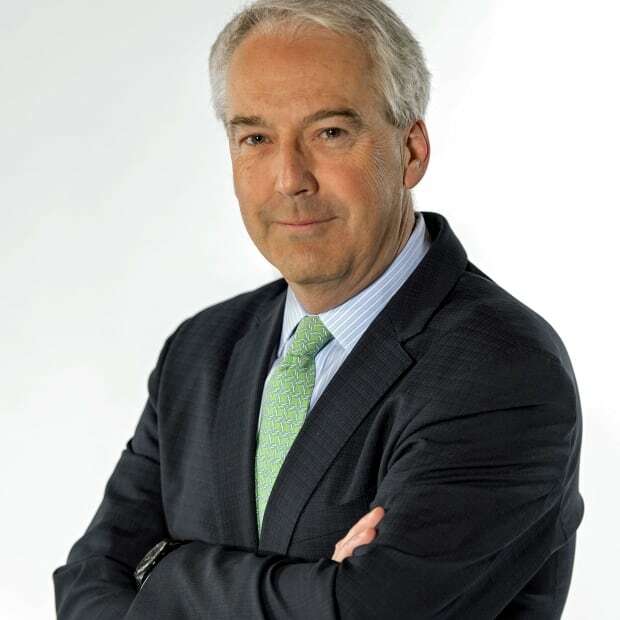 He began his reporting career with the Ottawa Citizen, before moving to CBC Radio in 1992, where he worked as a national radio reporter in Toronto, Halifax and St. John's. He returned to Ottawa and the Hill in 1998.